High levels of gloss, and a surface that really shines, makes Priplak® Karat the material of choice for packaging high end products and brands. Priplak® Karat is also terrific when used as a promotional pack or wallet for valued clients, as well as for seasonal POS. Explore this new range – and ask your local distributor for one of our stunning sample pillow packs. Catch the sparkling reflection from thousands of tiny particles that help define Priplak Stardust as one of our most popular special grades. 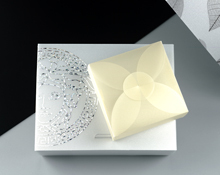 Adds a new and subtle dimension to stationery, presentation products, packaging or POS. A versatile performer that is as classy as it is understated.